IFA Buenaventura Hotel is a three-star hotel that features bed & breakfast, half-board and all-inclusive boarding options. This hotel is celebrated among couples, families and solo travellers looking for a seaside holiday in Gran Canaria. There are restaurants, bars, clubs and shops within walking distance—mostly around the beach. The beach is quite huge and you will find tons of motorised and non-motorised water sports. It features medical service, car rental, currency exchange, jeweller shop, souvenir shop and more within the complex. The hotel has a lovely pool, several gourmet restaurants and leisure activities lined up for guests. Being close to the desert, the hotel offers spectacular views of the landscape. 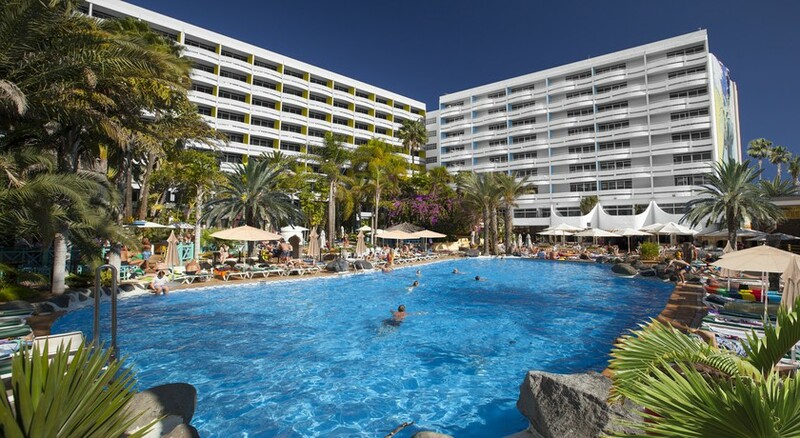 Located around 700 metres from the beach, IFA Buenaventura Hotel is a large three-star property. 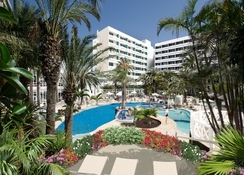 It is situated in the famous resort of Playa del Ingles (Gran Canaria), Spain. 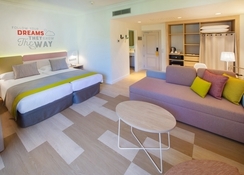 The Maspalomas Golf Course is less than 4km, while the Lopesan Meloneras Golf is about 9km. The seaside towns of Meloneras, Costa Meloneras, Maspalomas and San Agustin are within easy commuting distance from the hotel. You can organise trekking and camping trips and explore the beautiful island to the fullest, or simply go shopping and clubbing—the Gran Canaria Airport is 31.5km from the hotel. 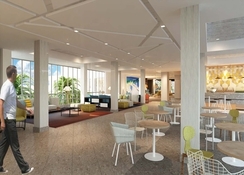 IFA Buenaventura Hotel features over 700 guestrooms. The accommodation plan includes a private bathroom with amenities, furnished balcony/terrace and bedroom with double or single or twin beds. 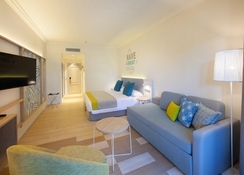 The interiors are simple with light colour walls and multi-colour linens. Common facilities include sofa bed, TV with satellite, phone, hairdryer, safe box, mini work station, ceiling fan and mini fridge—note that you might have to locally pay to use some of the room facilities. The balconies overlook the sea, garden or pool sides, depending on the location. Housekeeping, and fresh towels and linens are provided daily—for crib do approach the front desk. La Guitarra is the main restaurant that serves breakfast, lunch and dinner in international buffet style. In addition, the Picnic Bar is an informal self-service destination that serves light meals and snacks. In case you’re on a strict diet do inform the management in advance—torn jeans and sleeveless clothing are not allowed inside the restaurants. Honolulu and Banana are two pool bars that open during 10:30am – 5pm. They serve scrumptious light meals, snacks and various alcoholic and non-alcoholic beverages. Freddy`S Beer Bar (11am – 2am) located on the terrace is happy hour bar that not only offers a wide selection of local and international drinks but hosts live shows and entertainments. 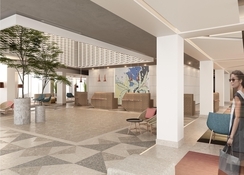 And in addition, the Meeting Bar (9:30am – 12am) situated close to the front desk serves hot and cold beverages and offers large screen TV, games and smoking area. Meal Plan for all-inclusive guests: breakfast (8am – 11am), snacks (11:30am – 12:30pm), lunch (1pm – 3pm), coffee & pastry (3:30pm – 5pm), dinner (6:30pm – 9:30pm) and sandwiches (10pm – 11pm). IFA Buenaventura Hotel features a large swimming pool surrounded by two whirlpools and a kid’s paddle pool. Sunbeds and umbrellas are available around the pools, so are food and drinks served. Regular entertainment programmes are organised in and around the pools, such as water polo, aqua aerobics, fitness gymnasium and other recreational activities. There is a multi-purpose ground where you can play basketball, football, handball, volleyball and more. Other fun facilities include table tennis, shuffleboard, pool tables, darts, and tennis courts—you might have to play for some of the games. Professional shows and animations are regularly organised, such as live music, dance, dramas, and other engaging shows—karaoke and night parties are also part of the night animation. Furthermore, there is internet cafe, mini super market, beauty salon, fitness centre, playground, and bicycle rental. The hotel was great for young families that want a party atmosphere suitable for all ages, The entertainment was spot on and the team and staff were constantly working hard. Arrived quite late to a warm welcome from the staff at reception. We were very pleased with our room it was huge! The food was good. Usual all inclusive, quite repetitive but still good and always lots. The hotel was quite large with lots of bars and 2 pools . The pool area was lovely and quite busy but lots sunbeds around. The hotel was situated only 5 mins walk from shops and not much longer to the beach. Overall we were pleasantly surprised with this hotel, we had read some of the reviews which were not great but in my opinion they were unjustified. We would definitely return to stay here again. The whole family went in this holiday. From start to finish it was amazing. Entertainment for everyone. Clean food great. Only negative is no air con and costs a lot if you want it. Would certainly come here again. One of the best holidays we’ve had. All staff were wonderful. All incl. Great drinks, staff, entertainment, pools, sunshine and friendly people. Rooms were standard n clean 👌🏼 perfect location. Was very average although not too bad. Food let it down otherwise it was ok. This trip was easily the trip of a lifetime for our family of four, and it will be quite some time before we stop talking about it!! We have a done a lot of travel with our children alongside us, but the adventures that were found around every corner on this African safari were beyond our expectations, and FAR beyond theirs! We were literally surprised around every corner as we found something unexpected, from a tote full of gifts upon our 5am arrival to Nairobi from our agent to a bag full of top-notch coffee mugs from our last hotel upon departure, not to mention the incredible services and attention given to us at both safari properties between. Our agent was clearly working behind the scenes throughout our trip to ensure that we were safe, well and taken care of, and she organised our family into perfect accommodations and safari properties for us. It was obvious that she took everything we told her during our planning stages and applied it to her trip framework, allowing us to get everything we were hoping for out of our trip to Africa, and MORE! The warmth of the Kenyan people was incredible, and our family was truly astonished by the obvious care they had for us. We were woken up each morning with trays of coffee, tea and hot chocolate, and tucked in with notes on our beds and hot water bottles warming our sheets. Our safari guides at both Lewa Wilderness and Kichwa Tembo will be legends in our family forever, as they both clearly took pleasure in showing our children every animal they could imagine, from the elusive leopard to herds and herds of zebras and huge prides of lions. From surprise breakfasts in the bush to night drives and walking safari, our children rose to every occasion under the care of our Maasai warrior guides, perhaps topped off as our soccer-playing kids got to join in with the staff soccer game at Kichwa, which they will genuinely remember forever as a highlight from their childhood. I was unapologetically the mother with tears streaming down my face behind my sunglasses as they were tucked into the team huddle, their smiles beaming as largely as mine. We have traveled a lot, but I found Africa a bit more intimidating in terms of health and wellness. I traveled with a bag that could have likely supported a small clinic as I was really worried about taking care of my family if anyone fell ill, and I wish I had trusted the wise words of agent a bit more as I never opened the bag, but I definitely spent a fair amount of time before the trip worrying about it! In terms of the logistics and pace, our agent got it EXACTLY RIGHT, and I will always be grateful to her for helping us to have the best adventure of our lives.